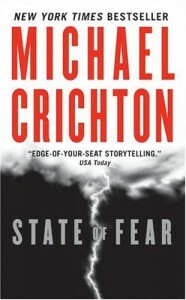 State of Fear - Michael Crichton - review - Level up! This is a hard one to review, I'm going to spew a lot of words. I'm going to hide them behind spoiler tags so that my review will read better. This is a fictional book about climate change. Specifically, it's a fictional book that purports climate change to be fictional as well. If you are reading this with the intent to debate the subject of the book (rather than its literary merit), I will ignore and possibly delete your comment. Okay, so let me clarify this post by giving a bit of a backgrounder on myself: I have a BS in Chemical Engineering, including relevant coursework in environmental and air pollution engineering. So, I am not a climate scientist, but I come from a climate science-adjacent field. In my studies, we did a lot of discussing about Climate Change in my undergrad. My school was about as right-wing as they come, so many of my professors were climate change skeptics. We went through several of the arguments presented in this book, debated and weighed the pros and cons, etc. That was in 2001, just before this book was published. a) Earth's climate is changing-- global temperatures in aggregate are increasing at a rate heretofore unrecorded in history. This is a reversal of medium and longer-term trends in temperature and unrelated to the current interglacial period we appear to be in. b) CO2 concentrations in our atmosphere have increased dramatically since the industrial revolution. While CO2 is harmless and has been in our atmosphere since the beginning, this trend in concentration is new, abrupt, and opposite to the trend for the last several million years. The general source of most of the CO2 currently in the atmosphere is combustion, particularly of fossil fuels. c) The current climate trends appear to be linked to the release of CO2 into our atmosphere. Because Earth's climate is so complex, long-term effects are difficult to predict with accuracy. Nevertheless, we can expect that increased global temperatures will precede a rise in sea level, and other catastrophic climate-related changes, including local desertification, erosion, etc. ON TOP OF THIS, I have an MBA with a Statistics emphasis, and I work as a quasi-statistician, (OK Business Intelligence Consultant) using stats, charts, and graphs. So, I'm not a climate scientist, but I have enough background to understand the science. I have enough of a statistics background that I know how to lie with statistics. I can tell when someone is cherry-picking data. My BS detector went off a lot in this book. So, I hated this book. I hated it, despite the fact that I really enjoy reading Crichton, and I thought the plot was somewhat interesting. Crichton goes out of his way to smugly contradict environmentalism, climate science, etc. He has lots of footnotes. He points out studies where data has been fudged, where charts are skewed, and data points are cherry-picked. Then, he goes out of his way to present fudged, skewed, cherry-picked points of his own. It would take me a long time to do a point-by-point takedown of Crichton's stuff, and it's not worth it for a work of fiction. After getting through the text, I came away with the impression that Crichton was a crazy, flaming climate change denier. 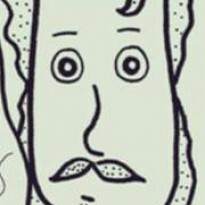 Then I read the endnotes. The opinion presented in the endnotes was well-reasoned, intelligent, skeptical, but not throw-the-baby-out-with-the-bathwater anti-environmental. So I want to believe Michael Crichton. I think he's a smart guy, but I think this book was irresponsible. Anyone reading the book but not the endnotes would come away with a sense that environmentalism is a con and a conspiracy. I've met folks who believe that. They're wrong. As a read, though, it seemed to alternate between chapters of fun crichton action and didactic preachiness about how wrong climate change is. It got a little nauseating. Now Crichton's skepticism isn't unfounded. I think we should take a hard look at our beliefs and make sure we're doing the right thing for the right reasons. This was unrelenting tin-foil hat stuff, though. Basically trying to say that nothing the environmental movement has ever done has helped. Even if you're skeptical of climate change, please don't believe that nonsense. Controlling pollution helps our world. Science is on our side and trying to make our world better. We can help the environment and the economy at the same time. Anyway, you could say that nobody bases their opinions about climate change on a pulp novel, but -- come on, what are your opinions on velociraptors? So, all this hand-waving goes to say-- don't read this book. Do yourself a favor.